Berggarten Sage is a special selection of the common Garden Sage. Berggarten translates to mountain garden which is one of the gardening areas of a larger estate, Herrenhauser, in Hanover, Germany. The bright green growth of the new leaves becomes soft downy gray older growth. Grown in full sun the plant develops a purplish cast. The large oval leaves are a change from the narrow pointed leaves of Garden Sage, but the flavor is just as good or better. Berggarten Sage rarely blooms and this helps to extend the life of this short lived perennial. Trim often by taking three or four inches of new growth. It is unadvisable to prune into old woody growth because this may stress the plant to the point of death. Also, avoid late fall pruning. This opens the plant up to winter's cold and may also be fatal. 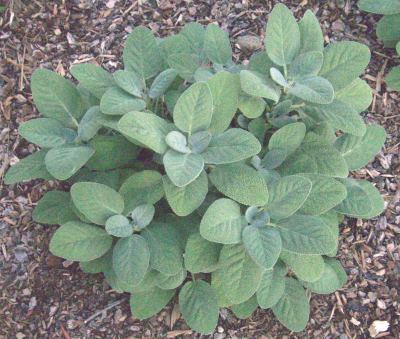 Use Berggarten Sage in any recipe calling for Garden Sage. 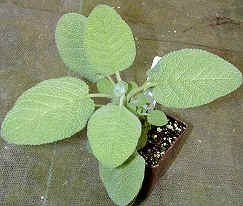 Berggarten Sage would make a tasty addition to our Kitchen Herb Garden Six Pack or our Gourmet Herb Garden Six Pack. This plant is sometimes available in plug trays. These trays hold 128 of all the same plant. They are a great low cost way to fill a lot of space. Each cell is 3/4 of inch by an inch. Check here to see if Berggarten Sage Plug Trays are available.